Grand Central gave customers a preview of its new look as the first of ten refurbished trains took to the tracks en route to London. The interior and exterior overhaul has been designed with business and leisure passengers’ comfort in mind. The upgrade includes: a full interior refresh, new seats with leather edging in standard class, new floor covering throughout, exterior and interior repaint, upgraded catering facilities, refitted toilet facilities with disabled access and baby changing facilities. The upgrade will also include energy efficient LED lighting, and power sockets for charging mobile phones, laptops and other electrical devices. 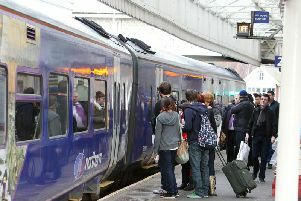 Grand Central operate services which directly link Halifax and Brighouse with London. The train company was recently voted number one train operator for overall journey satisfaction, as well as being voted best value long distance train operator for the sixth year running in the National Rail Passenger Survey (Transport Focus, Autumn 2017). The refurbishment is part of Grand Central’s ongoing investment programme; enhancing the customer experience on-board, online, and at stations. Dave Hatfield, Grand Central’s Fleet Director, said: “We’re delighted to bring this refurbished Adelante train back into service and let our customers see what we have been working on behind the scenes. Richard McClean, Managing Director at Grand Central, said: “I’m sure passengers using this train will enjoy travelling Grand Central in greater comfort, in smart surroundings and with enhanced on-board facilities. “We pride ourselves on listening to our passengers and taking on board their informative feedback.